Like most of my recipes, this one is just a few simple steps. 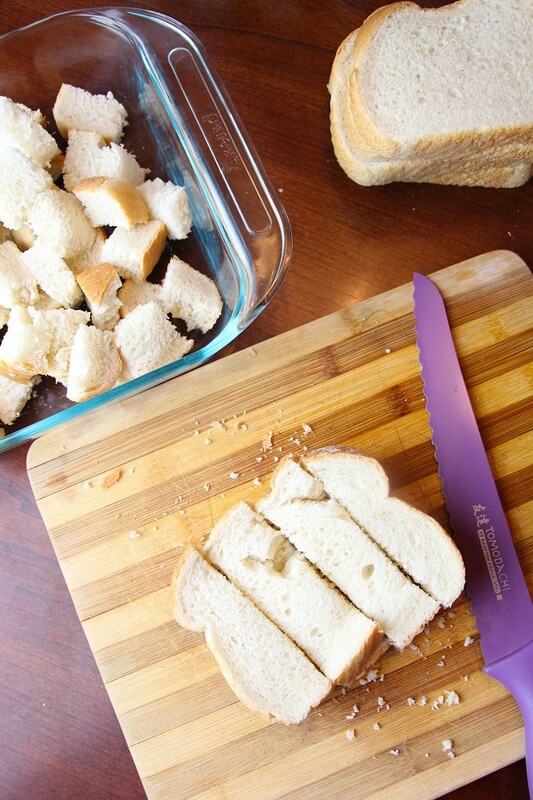 The first thing you need to do is to slice your bread into 1″ cubes. I used sandwich bread for this batch, but a loaf of french bread also works well. If you want to make this healthier, you can swap out the white bread for whole wheat. 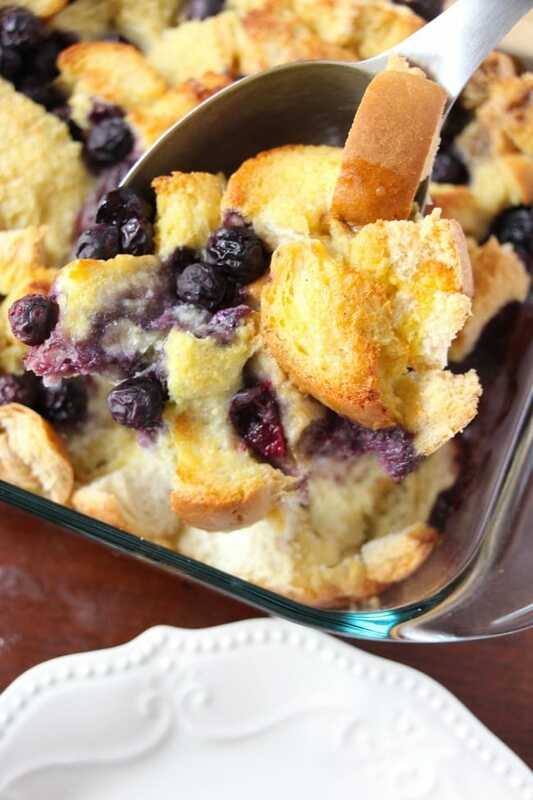 Place the bread cubes in a baking dish and sprinkle the blueberries on top. Next, you’ll whisk together the egg, milk, sugar, cinnamon and salt. Pour the egg mixture over the bread crumbs, making sure to coat all of the pieces. The egg mixture needs about 30 minutes to soak into the bread completely, but can soak overnight in the refrigerator too. So, you can prepare it the night before and all you have to do the next day is toss it in the oven while you get the family ready for the day. Now you just have to pop it in the oven for 45 minutes to finish it. If you get up much earlier than your kids, you could make this for a weekday breakfast. Since my kids leave an hour apart due to different school start times, we usually reserve this meal for weekends. You can sprinkle a little powdered sugar on top or serve with syrup. 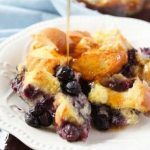 I sometimes heat up frozen blueberries in the microwave and as they warm up, it creates a simple blueberry syrup that goes well poured over the French toast casserole. Cut the bread into 1" cubes and place in a buttered/greased 8x8 casserole dish. Sprinkle blueberries over the bread pieces. In a large bowl, whisk together the eggs, milk, sugar, cinnamon, and salt. Set aside. 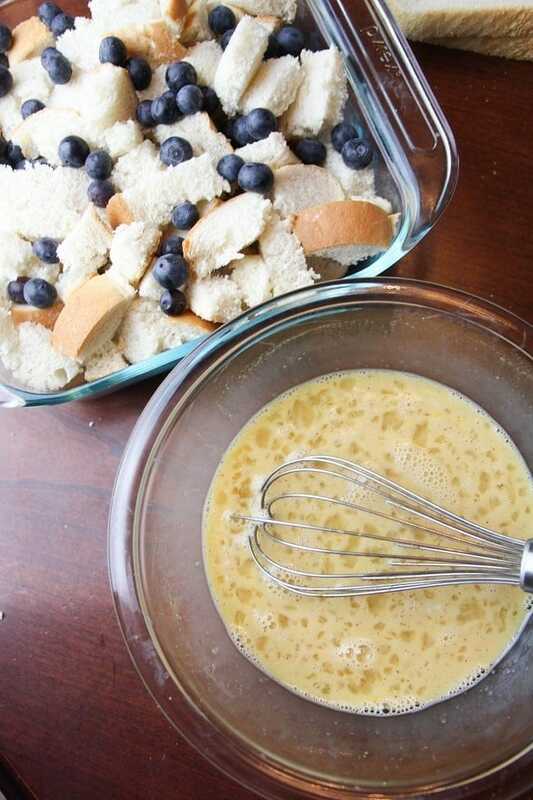 Pour the egg mixture over the bread cubes and blueberries; cover. Refrigerate 30 minutes or overnight. When ready to bake, preheat the oven to 325F and bake for 45 minutes, until the eggs are set and the bread is golden brown. Note: If you want to use a 9x13 plan, simply double the ingredients and add 10 minutes to the cook time. I did a 9×13, doubled the ingredients, added 10 minutes, ive done it with the tinfoil and with out. I dont wanna give my family salmonella poisoning! So what the heck am i doing wrong! The only thing I can think of is that maybe your oven temperature isn’t calibrated correctly. In our last house, we had this problem but our oven ran hot, not cold. Try increasing the temperature to 350 degrees and keep the cook time the same. I haven’t tried it with pie filling, but I think that could work! The texture will be different, but perhaps better — a little moister and more like syrup-coated. I’m traveling this week so won’t get a chance to try it this way for several days, but if you attempt it, please come back and let me know how it turns out! YUM! Made this last night and we ate this morning. It is truly delicious! I changed a few things, based on what I had available. Used cranberry raisin bread and added roasted pecans on top. Boysenberry syrup on the side, if desired. Can i use 1% milk? Absolutely! The consistency will be a little different, but if you normally use reduced fat milk, you’re likely familiar with the difference. If you are worried about the bread coming out less moist but don’t have whole milk or cream, add 2 or 3 tablespoons of melted butter to the egg mixture before whisking. I don’t see what size Pyrex dish to use for this amount. If I need a 9×13 dish, how would you increase the recipe? Also do you need to spray the dish? Thanks for the questions. I’ll update the recipe with better details. I used an 8×8 dish. I have made it in a 9 x 13 though and when I do, I just double the recipe. The result is slightly thicker than the original version but bakes through just fine with an extra 10 minutes in the oven. Yes, butter or grease the pan first, no matter what size dish you use. As long as you let it cool completely before freezing, I don’t see why not. Do you think this is OK in the fridge over 3 nights then bake? Although eggs can keep up to 4 days in the refrigerator, personally I wouldn’t do anything longer than two days. Another option would be to freeze it and then move it to the fridge the day before you want to bake it. Delicious! We loved the fresh blueberries! 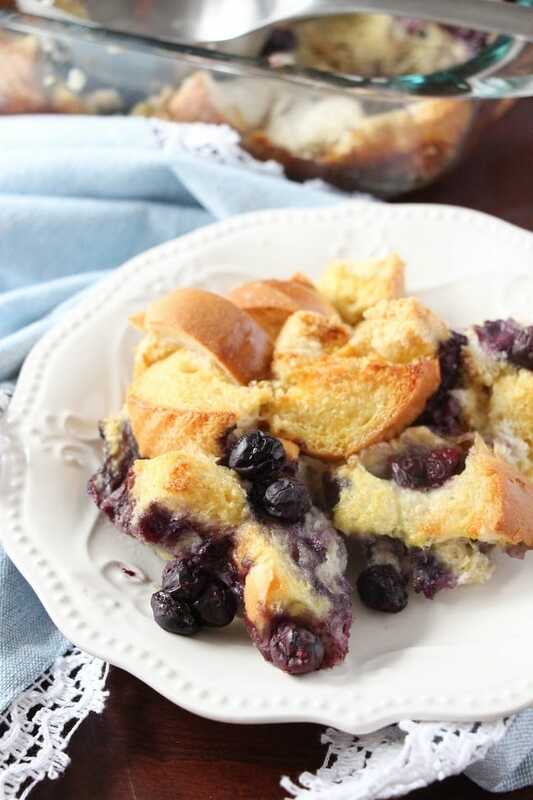 What a genius way to get that blueberry pancake taste in an overnight casserole. Haven’t tried, but looks like something my grandkids would like. Hi Sue, I’m terrible about listing the serving sizes for my recipes because my family throws things off. With a couple of teenage boys, my perception is always skewed! I believe, if serving people with normal appetites, this will yield about 6 servings. My kind of recipe!! The boys raved. Then, I got an idea to make it more to my tastes for the next time… and I used 1 cup of sliced strawberries AND 1/2 cup semi-sweet chocolate chips instead of blueberries. You are welcome! LOL! Can this recipe be doubled? Have you ever used strawberries or bananas in addition to the blueberries? You can definitely double the recipe with no adjustments other than to use a larger casserole dish to accommodate the larger quantity. Depending on the dimensions of your dish, it may need a few extra minutes. Just make sure the egg is set and the toast is golden brown. I have used other berries before (strawberries and blackberries) but never bananas, though that sounds really good! Thank you! I am looking forward to making this recipe! Hi! This is one of my favorite versions. I want to make again for a crowd over holiday. How do you think it would freeze? Hi Cari, I’m glad you like the recipe! I’ve actually frozen this one before. The trick is to freeze it BEFORE baking. I just put plastic wrap over the top and then secure the casserole lid on top of that. If your dish doesn’t come with a lid, you can use aluminum foil instead. Then, when you’re ready to make it, take it out the night before and put it in the refrigerator to thaw. Bake the next morning like usual, though you might need to add a few extra minutes to the cook time if it hasn’t completely thawed overnight. Made this for Mother’s Day brunch, was a huge hit! Want to know if you bake it covered w/ foil, or uncovered? Hi Chris, I’m so glad you liked the dish! It’s one of my favorites. I bake mine uncovered. I like the top nicely browned and a little crispy. Great question since not everyone likes it that way.